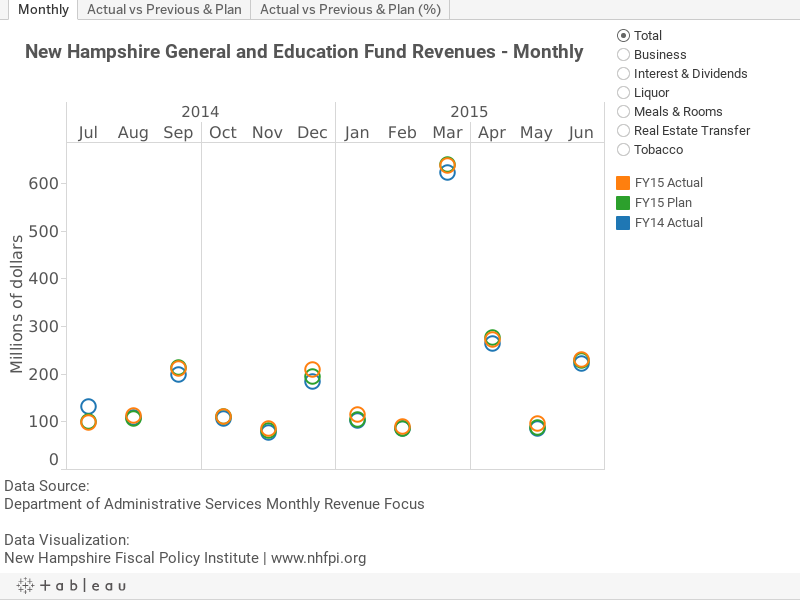 With the debate over the state budget entering its final stages, NHFPI is starting a new project, using the data visualization tool Tableau, to help improve public understanding of fiscal and economic trends important to New Hampshire. As you’ll see below, our first foray is based on just-released data on state revenue collections for the month of May. Each of the four tabs below presents information on New Hampshire General and Education Fund Revenues in a different manner. Within each tab, you can hover over each data point for additional context. Also, on the right hand side are seven radio buttons. This capability allows you to further investigate revenue trends by specific tax type or by total collections. We hope you’ll enjoy seeing and interacting with data in this fashion and encourage you to check this space regularly for new visualizations. Below this particular visualization are a few of our insights on current revenue trends based on review of the underlying data. Revenue collections for FY 2015 will likely surpass initial expectations. Through the month of May, General and Education Fund collections are about $2.03 billion. If you click on the tab labeled Actual vs Previous & Plan and make sure the Total radio button is active, the data show that revenue is $39 million more than where legislators thought state revenues would be at this point in time when they originally adopted the FY 2015 budget. This is an encouraging sign. With only one month to go in FY 2015, it is highly probable that the state will end the fiscal year with more monies than anticipated. In order for this not to occur, June revenue would need to be less than $189 million, which amounts to at least a 15 percent decline from June 2014, a doubtful scenario. Furthermore, June collections over the past three fiscal years have exceeded plan, further increasing the likelihood of revenues overall surpassing expectations. On the Actual vs Previous & Plan tab, you can also see (by clicking through the various revenue streams) that the bulk of the previously noted $39 million comes from three taxes: meals and rooms ($12 million ahead of plan through May), tobacco ($13 million), and real estate transfer ($11 million). May revenue figures suggest that the Governor and Senate might be too conservative on their FY 2015 business tax estimates. Over the past few weeks, both the Governor’s Consensus Revenue Panel and the Senate Finance Committee have fine-tuned their revenue estimates for the current fiscal year as well as for the upcoming biennium. In regards to business taxes for FY 2015, they are in close agreement: the Governor has business tax collections at $547 million, while Senate Finance estimates the figure to be $546 million. As of May, the state has already collected $469 million in business taxes for FY 2015. If one assumes that New Hampshire will collect as much in business taxes in June 2015 as it did in June 2014 ($91 million) – a realistic assumption, given the trend of the last several years, then collections will total almost $560 million for the current fiscal year. Certain months are more important for revenue collections than others. Unlike your paycheck, which usually stays pretty stable from month to month, state revenues fluctuate quite a bit. The most important months for New Hampshire, as shown on the Monthly tab, are September, December, March, and April; June is also important, but not visible since we do not have data. Why these months and not August or November? A couple of reasons. First, if a New Hampshire business pays estimated business taxes, they usually pay a quarter of their estimated liability in April, June, September and December. In addition, corporate business tax returns are due March 15. Second, the Statewide Education Property Tax, which is assessed and collected by municipalities for the purposes of supporting local education, is collected once a year in March and totals $363 million, or roughly 16 percent of General and Education fund revenues. Lastly, since Interest and Dividends tax returns are due by April 15, roughly 40 percent of the tax is collected in April.